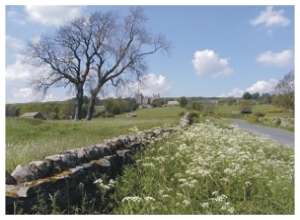 Looking uphill towards Castle Bolton in Wensleydale. Along with the Scottish Highlands the Yorkshire Dales hold a special appeal for us so it is only natural that we should design a range of kits reflecting the beauty of the area. ‘Helmsley’ is the first in this new Yorkshire Dales range. Over the next few weeks other new kits will be added.